← The best tomato pasta in the world! After our disastrous summer, Mr Mac and I took ourselves off to Italy last month to catch some late summer sun……and we were not disappointed. 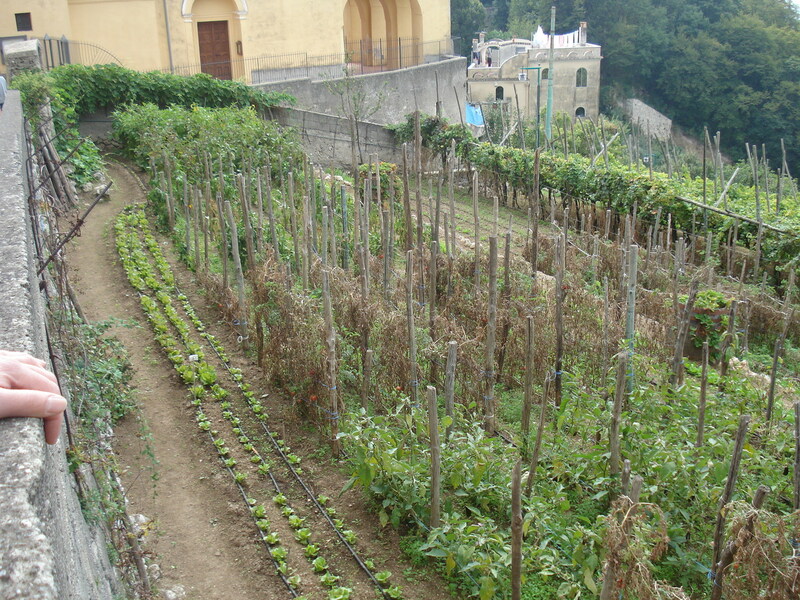 This was our third trip to Italy, our second to Ravello and my first as a gardener. From previous holidays my lasting memory was tomatoes. Big fat ripe juicy sweet tasty tomatoes everywhere. When I think about it, that is probably why tomatoes are my most precious crop. But our wishy washy Scottish summers cannot compete with the sunshine and heat of Naples and the intensity and sweetness of flavour they bring. A simple insalata pomodoro can make you smile all day! This time, having spent all year scrutinising my own garden, I was immediately draw to all things green and vegetative. 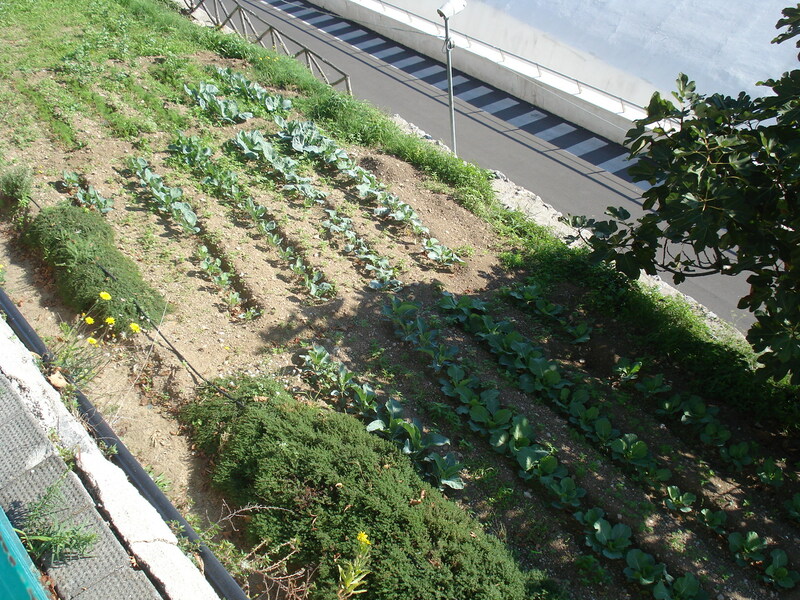 What struck me the most was how every square inch of ground is given up to growing fruit and vegetables. These vegetables were being grown in the ground at a hairpin bend in the road! 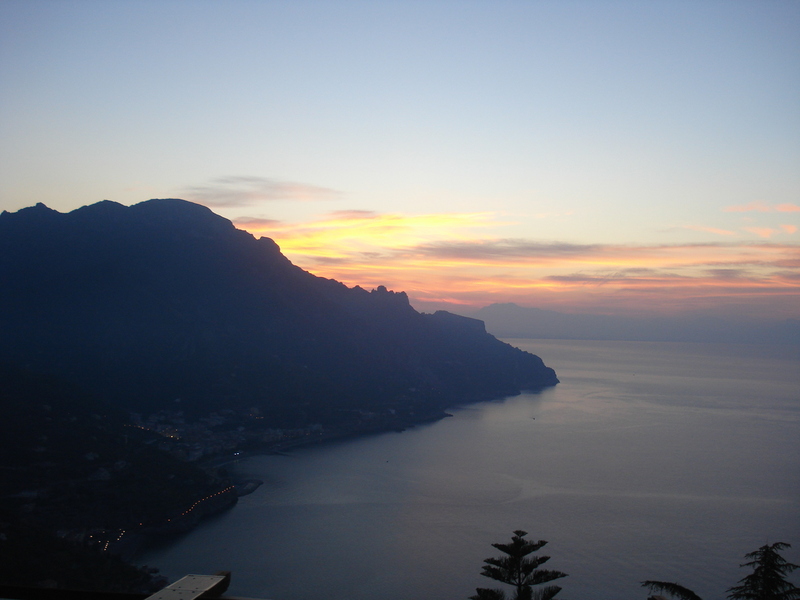 Ravello sits 375 metres above sea level. Check the view from town down to the sea. 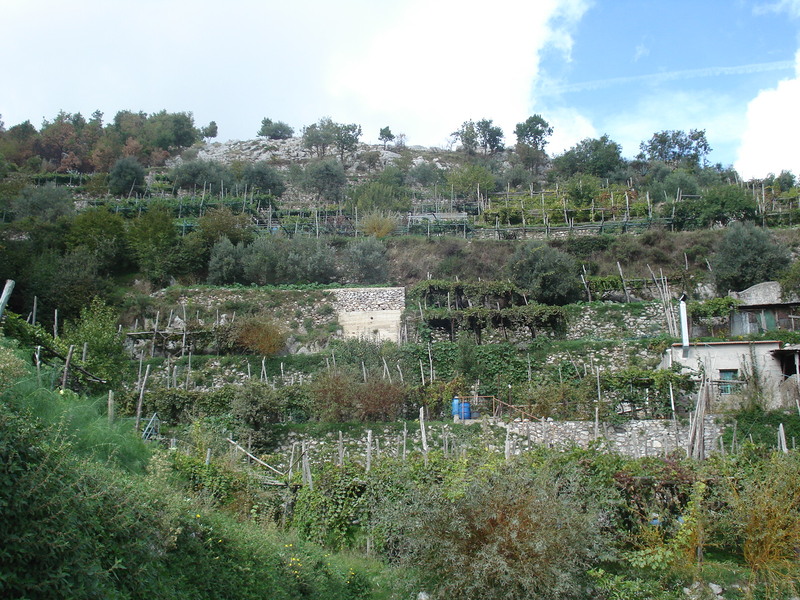 Almost vertical but look at all the terraces filled with produce. Even the hotels were getting in on the act and making a big deal about growing their own fruit and veg. This is the garden for the Hotel Villa Maria. This did backfire on us though. On our first day we were treated to a delicious antipasti of figs with parma ham. Every day after that when we asked for figs we were told, “figgies finish”. The hotel’s fig tree was empty. However, on our last evening our waiter gave a conspiratorial wink when we gave our order, he disappeared for ten minutes and then returned with a plate full of juicy ripe figs. He nicked them from a neighbour’s garden! As so much ground is given over to growing fruit and vegetables there are not many flowers in gardens. Other than Villa Rufulo and Villa Cimbrone where there are cultivated beds of roses and dahlias, most of the flowers we saw were wild. 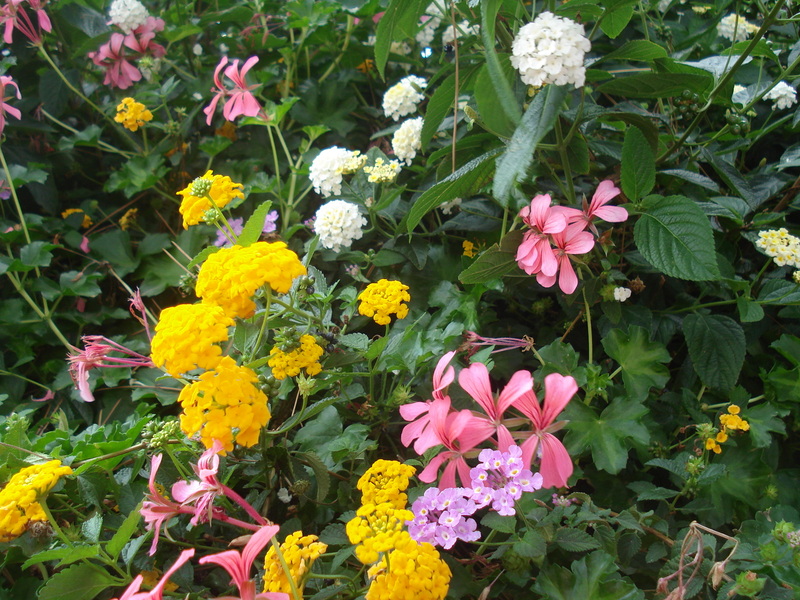 A perfect example can be seen in this bush growing wild. And remember my blue wall project I tried this year? 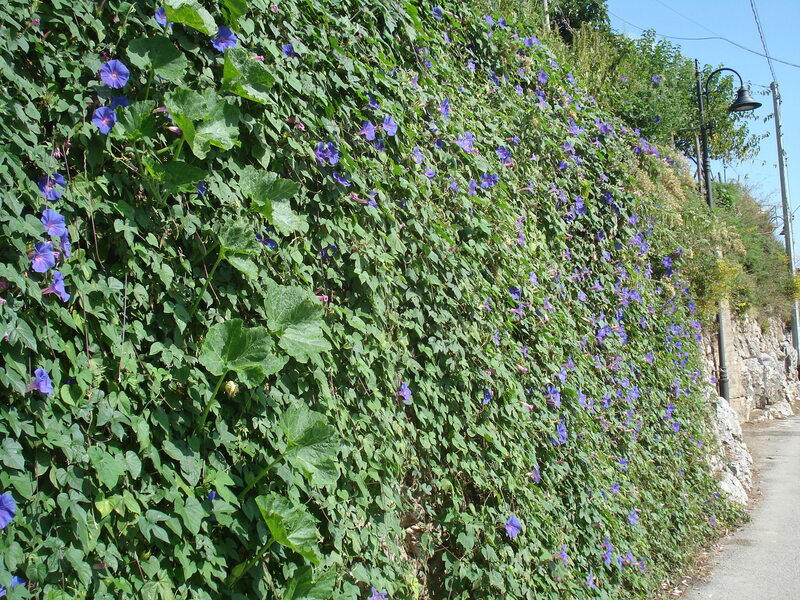 A trellis full of blue sweet peas and morning glory…well these morning glory climbers at the side of a road were slightly more successful than mine! 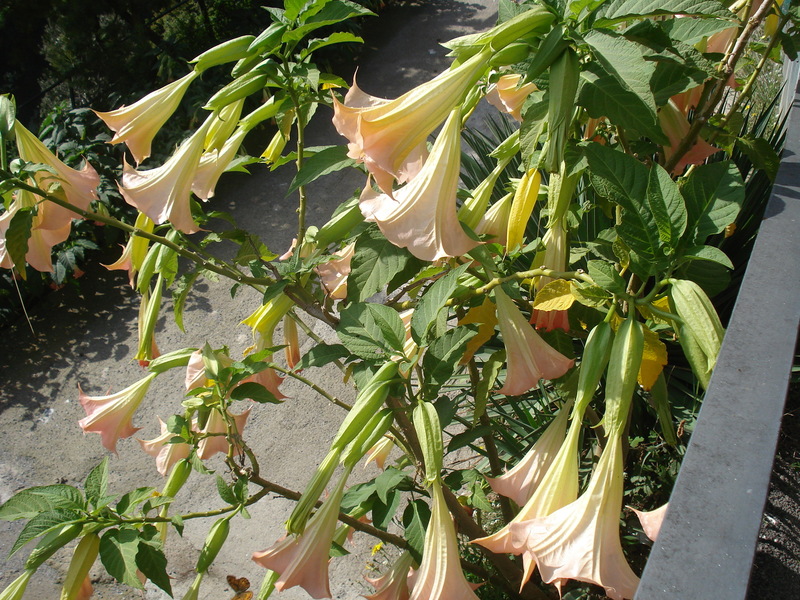 One feature of almost every garden was these trumpet flowers in yellow and peach….absolutely stunning. 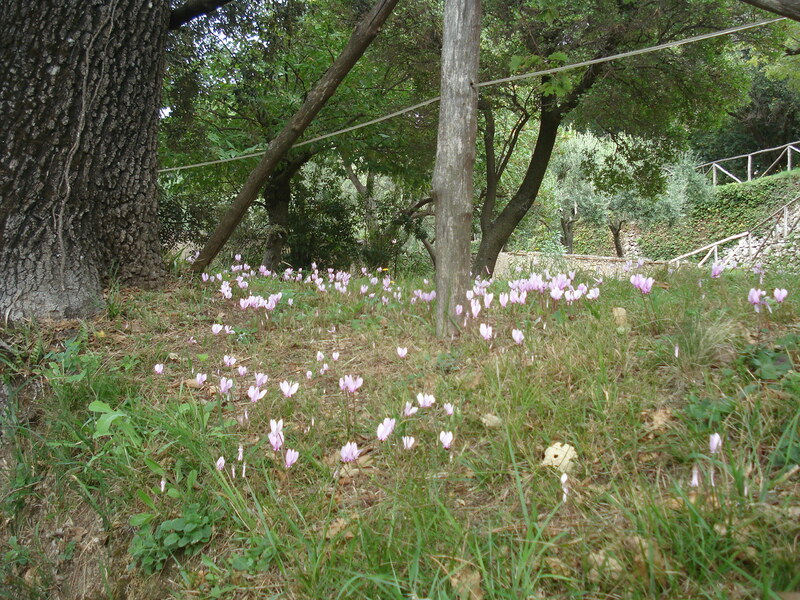 Cyclamen were also growing in abundance under every tree. A far cry from the potted up versions currently being sold in our supermarkets and garden centres. 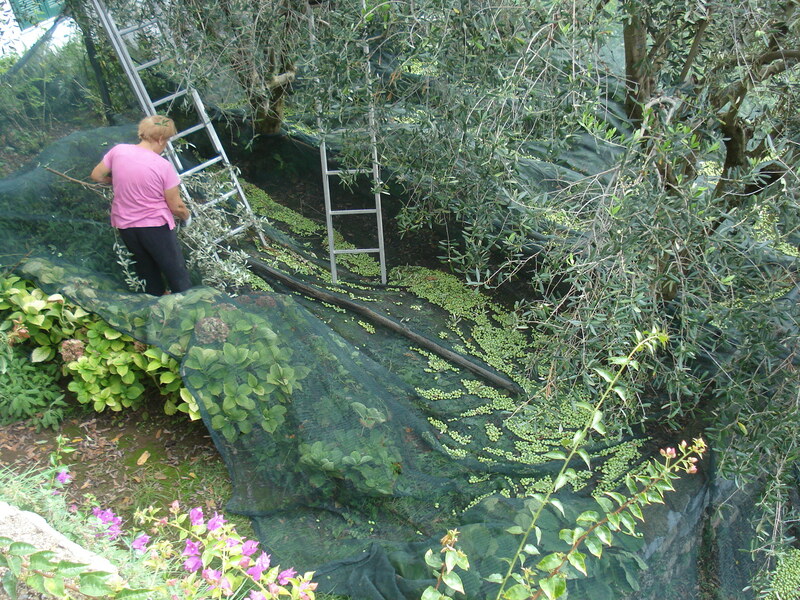 Finally, it would appear to be law that to be eligible to collect olives you must have a minimum age of 80! It was scary how many old couples with a combined age of 160 we saw climbing trees. 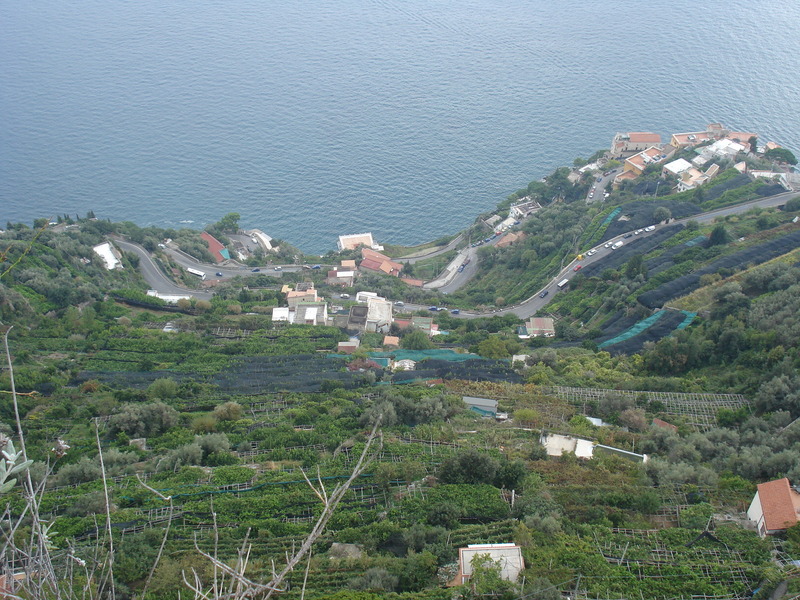 This entry was posted in General and tagged flowers, gardening, gardens, growing fruit and vegetables, growing tomatoes, Ravello. Bookmark the permalink.